Carla Madeleine Kupe, Esq., is the founder and president of The Impact Alliance NFP. Carla considers herself a strategist, an educator and trainer, and a collaborative leader. Her unique personal background has translated into unique and innovative problem-solving approaches throughout her career. Carla is the first-born of five children of Congolese parents, speaks eight languages, was born and has lived in Europe, and has been calling the U.S. her home since 1997. Carla has a remarkable ability of putting herself into another's shoes, to see an issue from different vantage points. This refined skill has enabled Carla to consistently render comprehensive advice and lead collaborative projects with people of all walks of life. Carla loves to be the architect of preventive and proactive strategies but also enjoys devising strategic change to improve existing systems and organizational cultures. Strategizing is Carla’s second nature. Carla is Associate General Counsel as well as Title IX Coordinator for Chicago State University. Carla is also the creator of Speak Truth Summit, a platform which sets out to give voice and visibility to issues that uniquely and particularly impact women of color. Before joining CSU, Carla was an Assistant Corporation Counsel for the City of Chicago Law Department first as a prosecutor in housing court until 2011 and then as a defense litigator for the City of Chicago and the Chicago Police Department. She has held many leadership positions in non-profits such as Director of Community Relations for the Chicago Metropolitan Chapter of the National Organization of Black Law Enforcement Executives. Carla has a record of advising start-ups such as Chicago-based L’École Française , Executive Choice Security Solutions , and Kikwetu Coffee Company in business development and marketing strategies. She lends her expertise to fellow consulting firms. Most recently she has advised and collaborated with the City of Chicago Mayor’s Office, Chicago Public Schools leadership, the Chicago Police Department and other law enforcement entities, including the Department of Justice's COPS Office. Carla loves to be the architect of preventive and proactive strategies but also enjoys devising strategic change to improve existing systems and organizational cultures. Carla is a natural educator and trainer. Carla has an extensive background in matters related to youth which includes education and mentoring as a former Behavioral Specialist for the Alliance for Inclusion and Prevention and instructor for various after-school programs. 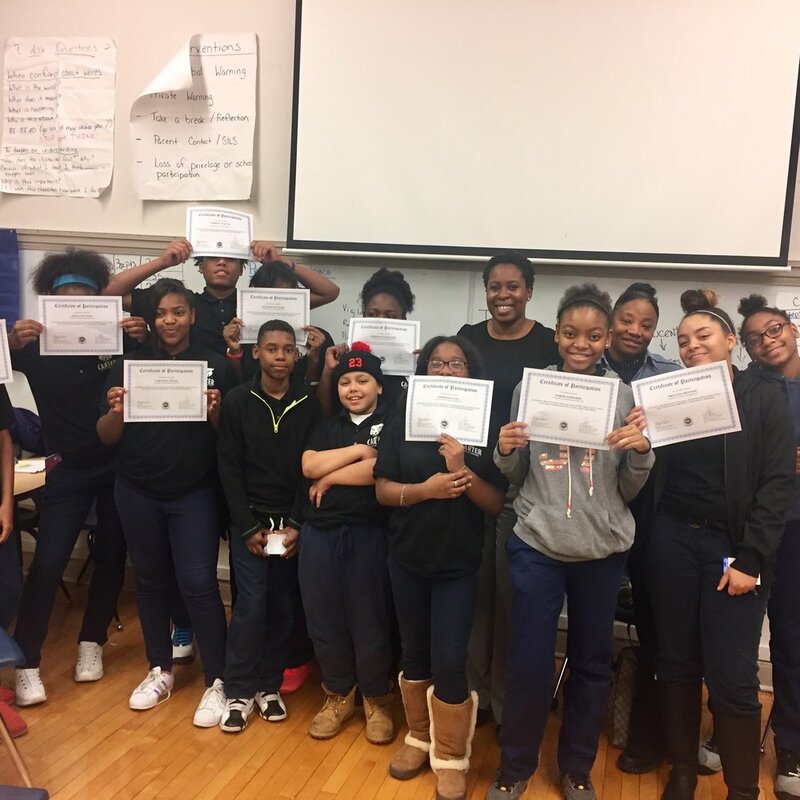 As trainer, Carla has crafted training programs and trained many, including over 400 Chicago Police Department members in a youth-law enforcement relationship-building program called “The Law & Your Community” which was featured on the national CBS Evening News. Carla has also been a co-creator of the "Upstander Action League" workshop in hate crime intervention. Carla has assumed many positions as teacher, tutor, and mentor in organization such as the Minority Legal Education Resources and the Loyola University Chicago School of Law Diversity Mentor Program. Carla has been called on as a panelist or speaker for university and law school students to speak on matters such as implicit bias, micro-aggressions, and other social justice related topics. Carla gave herself the nickname of “the Connector & Convener” because of her uncanny ability of bringing parties together, either across different sections or within in an organization behind a common goal. Be it as Director of Community Relations of the Chicago Metropolitan Chapter of the National Organization of Black Law Enforcement Executives, as Assistant Corporation Counsel for the City of Chicago, or as Victim Witness Advocate for the Suffolk County District Attorney’s Office in Boston, and throughout her career, Carla has a proven record of collaborative leadership and success in forming partnerships. Carla has received much recognition for her community involvement and advocacy including the Donald L. Hollowell Distinguished Service Award from the Loyola University Chicago School of Law in 2016 as well as Special Recognition Awards from the National Organization of Black Law Enforcement Executives in 2015. Carla is part of different diversity-focused entities and programs including the Dean’s Diversity Council at Loyola University Chicago School of Law and the Illinois Council on Diversity Editorial Board. Carla also sits as a Giving Council member for the Chicago Foundation for Women. Carla received her J.D. from Loyola University Chicago School of law, Chicago, Illinois, and her B.A. in Political Science with a minor in Psychology from Kalamazoo College, Kalamazoo, Michigan. Sheila Bedi is an Clinical Associate Professor of Law at the Northwestern School of Law and an attorney with the Roderick and Solange MacArthur Justice Center. Her work focuses on ending mass imprisonment and enforcing the rights of people caught up in the criminal and juvenile justice systems. Previously, Bedi served as the deputy legal director of the Southern Poverty Law Center in New Orleans and Mississippi where she represented people who are imprisoned in federal class action litigation challenging abusive prison conditions and worked on community-based policy campaigns aimed at reducing incarceration rates, ensuring fairness in the administrative of justice, and improving access to public education and mental health services. Bedi worked with people who were formerly incarcerated and their families on hard fought campaigns that closed abusive prisons and jails, protected people who were imprisoned from sexual violence, improved access to counsel for poor defendants and people living behind bars, developed alternatives to imprisonment and reduced the number of children who are tried and convicted in the adult criminal justice system. Some of her honors include the Public Voices Fellowship, the Heroes for Children Award, the NAACP's Vernon Dahmer Award, the NAACP's Fannie Lou Hamer Award. Ce Cole Dillon is Co-Founder and Chief Executive Officer (CEO) at Student Loan 411 LLC, and the author of What You Don’t Know About Student Loans Can Hurt You (Don’t Finance What You Can Afford) (2015). Ce worked over 25 years in the Silicon Valley for technology companies in domestic and global positions. Ce’s leadership work includes working as a trial lawyer, corporate counsel, technical instructor and senior global business manager in technical education and customer support for leading firms, including Oracle Corporation. Ce’s public service includes serving as a Delegate for Hillary Clinton, 2016 Democratic National Convention; a member of the Platform Committee – 2016 Democratic National Convention; A member of the Task Force of the League of Black Women producing the white paper – Blackwomanomics: A Policy Framework in February 2016; Member Advisory Board, i c stars; Member Office Of The Treasurer, City of Chicago, Neighborhood Think-tank Initiative; Member Task Force on the Black House – Northwestern University, Member Council of 100 – Northwestern University, and Member Banking and Finance Committee – Illinois Black Chamber of Commerce. Nancy Nassr began her career as an educator nearly fifteen years ago where her journey afforded her many unique and rich opportunities to become the forward-thinking educator she is today. Nancy is a progressive educator whose teaching philosophy is firmly rooted in issues of social justice and transformational education. For Nancy, teaching and learning are deeply personal—education is about constant self-reflection and growth. In her previous role, Nancy worked diligently to create unique pathways for student learning by using games and game-like learning principles to engage both students and teachers alike in design and inquiry-based thinking. Nancy has developed and designed games for both the classroom, and for professional development with teachers. Perhaps her most impactful work with teachers has been designing and leading professional development with a focus on culturally relevant teaching practices, and creating contextualized learning spaces that generate powerful learning experiences for students. Nancy is interested in pursuing her doctoral studies in Critical Race Theory & Education and holds a Masters in Educational & Organizational Leadership from Teachers College, Columbia University. Chipo C. Nyambuya is the Principal of Virgil, LLC. She began her career as in-house legal counsel in the financial services sector with a focus on copyright, technology procurement, and retail banking. She then transitioned to a career as an advisor for rule of law and governance projects in international development where she designed and taught organizational and operational frameworks for governmental institutions and non-governmental agencies. Chipo has nearly twenty years of cross-sector experience, advising Fortune 500 corporations, start-ups, international development agencies, and foreign governments. Her expertise ranges from negotiating multi-million dollar deals to helping establish legal and judicial institutions in post-conflict countries. She continues to advise organizations and governments on policy and rule of law issues relative to energy, education, economic development, and technology. In recent years, she has consulted for startup companies on technology law and for not-for-profit organizations while serving on the boards of Survivors’ Truths, 1919 at blue1647, Global Smart Kids, Institute for Work and the Economy, and Associated Colleges of Illinois. She also lectures at Northwestern University in International and Area Studies on CSR and International Development. Chipo received her J.D. from The Ohio State University College of Law, Columbus, Ohio and her A.B. with distinction, from the University of Michigan, Ann Arbor, Michigan.